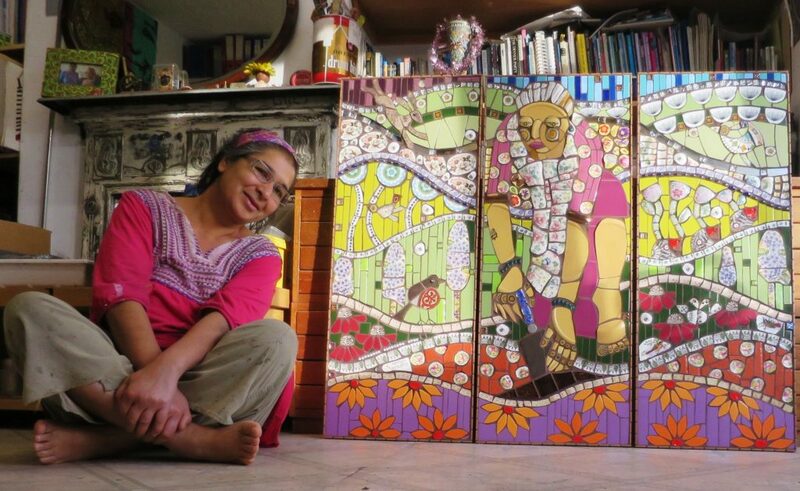 I was commissioned to create three mosaic panels in memory of my client’s mother. Flo was a keen gardener, I have depicted her digging in a tranquil setting. The entire mosaic measures 117 x 96cm. Each panel is 35 x 96cm, on 18mm marine plywood. The mosaic has been installed in my client’s home. The entire commission was created over 23 days between July to October 2018. It was installed in November 2018. Two people to uber THANK: Matt Lloyd of Infamous Community Arts for installing the mosaic at my client’s home. Film-maker Rob Lindsay for editing this filmette. © Copyright 2019, Mango Mosaics – All Rights Reserved.